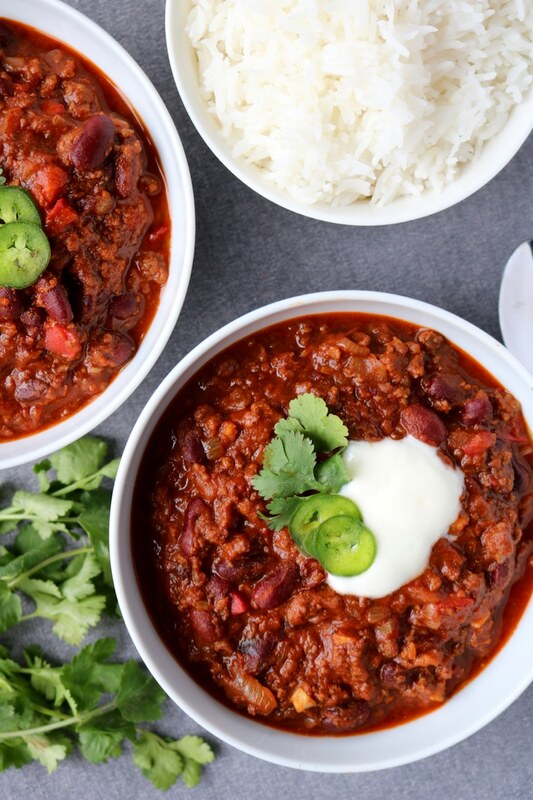 This Chili Con Carne is a simple and easy to prepare meal that makes a big ol’ pot of food, perfect for a Sunday dinner or simple meal prep idea that will last the entire week to come. The term ‘chili’ is short for ‘Chili Con Carne’ which is a Spanish translation from chillies with meat. Although many people in North America simply refer to it as chili, it wasn’t until I lived in England for several years that I realized Chili Con Carne was the original term for the exact same dish. 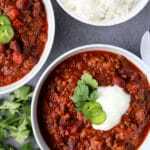 There are lots of different variations of chili, as everyone has their own take or twist, but I wanted to share a really simple but delicious recipe that is fool-proof to prepare. Although many people don’t think of chili as a particularly healthy dish, I would argue that it most certainly is. Made with 100% real food and grass-fed beef from truLOCAL, Chili Con Carne has a welcome place in my diet any day of the week. This recipe can also be done in the slow cooker if needed, however be sure to brown the beef before in order to get the best results and flavour. Add onion, bell pepper and jalapeño to the pot and cook, stirring often, for 5-7 minutes until vegetables soften. Add chili powder, cumin, oregano, cayenne (optional), sea salt and minced garlic, and cook for another 1 minute until fragrant. Add ground beef and cook, breaking up the meat with a spoon until no longer pink, approximately 5 to 7 minutes. Add in tomato paste and balsamic vinegar and mix to coat the beef. Add kidney beans and ½ cup broth, stir to combine, reduce heat and cover with lid to a low simmer for 20 minutes. Pour in crushed tomatoes and remaining ½ cup broth, and continue to cook on a simmer for an additional 30 minutes. Remove from heat and season to taste as needed.